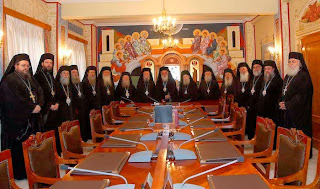 "At the proposal of the Synodal Commission on Heresies, the Holy Synod decided to send an Encyclical, whereby the Holy Synod will renew its assurance to the Orthodox Faithful, that neither in the past nor today is there a Clergyman of the Church of Greece, who is a member of any Masonic Lodge," notes the synodal statement. It concludes: "In this way the Holy Synod again condemns Freemasonry and considers it incompatible with the faith of Orthodox Christianity to be a member of Freemasonry." At their last gathering they had seen publicity photographs come to light of clergymen participating in gatherings that included certain Masonic groups, and this brought on various comments.